Jewelry gifts for the wedding party are a much-loved tradition. And there are inexpensive options. Earrings, necklaces, and bracelets are typical. And I’ve included some. But what, exactly, is jewelry? For purposes of this discussion, it’s pretty much any piece of bling you keep nearby throughout the day. So, keep that definition in mind here as you discover these 12 affordable wedding party gift jewelry wedding ideas for the gang who is helping you get hitched. Watches, keychains, tie bars, and cufflinks all qualify as jewelry in my book. The guys’ version of bling. Note: As with most My Online Wedding Help links, the links in this post go to the site’s shop section or to a merchant website. That said, THE CHOICES HERE ARE MY OWN. No one paid or asked to be listed here. My Online Wedding Help will receive a small commission from the merchant at no added cost to you if you click and buy a product. 1. Do you want to go further off the beaten wedding party gift path? How about a phone case? This one’s understated elegance will fit quite well with any wedding. The dignified initial is reminiscent of a single-letter monogram. The case is black. Your phone color shows through the initial and on the sides. Learn more or buy it from Daniela here. 2. Totally custom map cufflinks. Unique custom cufflinks make wonderful groomsmen wedding gifts idea. See how Linsey uses vintage maps to create these. The location is 100% personalizable. If maps aren’t your thing, she also makes an almost endless variety of unexpected styles. I’m kind of in love with the personalized envelope ones. And the little wedding vow roses. I’m not alone in loving Linsey’s work. She’s coming up on almost 4,000 reviews with a SOLID top-star rating. Seriously, you need to go to Linsey’s store here. You can find cufflink styles to fit the personality of everyone in your wedding party. These are just a few of the phrases customers are using in their reviews of Timothy’s gunmetal pocket watches. Watches make for a time-honored gift. And pocket watches add panache to the look. Combine that with an artisan that can do no wrong in his customers’ eyes. It’s an irresistible combination. A tip for you: Consider leaving the wedding date off the watches. People tend to feel weird carrying around anything with a random date on it. Unless it’s their own wedding or anniversary date. Go here for more information or to buy the pocket watches. Be sure to look at the review photos to see how the no-date option looks. 4. This father of the bride keychain is a fan favorite. Natalie wrote the heartfelt I loved you first poem printed on the presentation card. Take a look through the 5,000 top-star reviews. Notice she often includes a thoughtful free gift with your order as well. 5. If your dads are the classic type, tie bars are the ideal gifts. Kristina will engrave “Father of the Bride” or “Father of the Groom” on her traditional-look style. Or have her make one with custom wording from you. Take a look at Kristina’s Best Seller tie clip here. Let’s not forget the children. A big-person gift for the little ones will make them feel even more special. 6. What a unique and different ring bearer gift. Lego cufflinks! They are the ideal blend of grown up and child. AT $5 for each set in any Lego color, you cannot beat them for a budget-friendly, sure-to-be-adored gift. Need more proof? Read the reviews. Get the Lego cufflinks here for the kids and kids-at-heart. 7. Name bracelets are so popular. 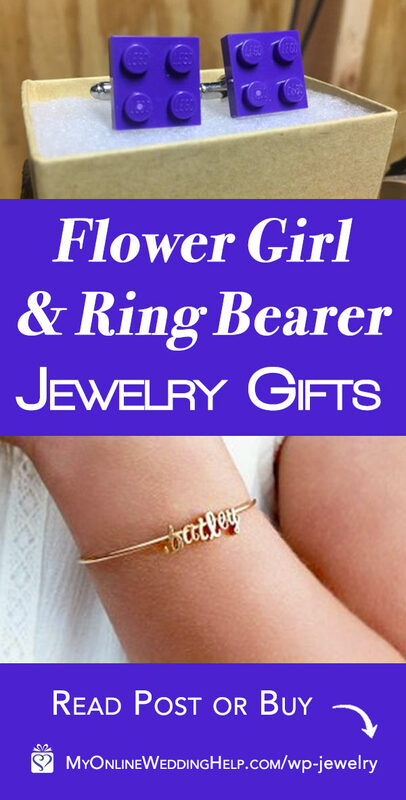 Your flower girl will fit right into the older crowd with this bangle bracelet with slide-on letter charms. It is adorable for a flower girl gift. And Debbie’s nearly 90,000 customers attest to the quality of her work. 16,000 five-star reviews legitimize her like no single person can! Debbie has other flower girl gift jewelry in her shop, too. Among her other best sellers is an initial necklace with a birthstone charm. And a cute little heart as well. I kind of like it even better than the name bracelet. Check out the necklace here. The most popular jewelry for the women are usually pieces they can wear or use on the day of the wedding. You may decide on something sentimental and engraved to commemorate the day. Or personalize it with their names. This route means they can wear their gifts long after the big day. 8. How about a glittery phone case? I know, I know! Again with the phone cases. But I find them intriguing. Simultaneously non-traditional, unique, and practical. This one’s rose gold. With almost 23,000 sales and a 4.5/5 star rating, people can’t get enough of TN’s creations. At around $33 with the name, this is the highest priced gift in the list. But with all that hand-crafted bedazzle, I still think it’s a great value. TN will put the names any place on the cover and in any color. Learn more about or buy the rose gold glitter phone case from TN here. 9. If a phone case is a little too far afield for you, how about a more traditional initial heart necklace? Eaindar has been making and selling jewelry since 2004. Take a look at the multiple pages of 5-star reviews from her customers. People love the value she brings to a wedding on a budget. This personalized heart necklace is the perfect example. Less than $15! Take a look here to buy it from Eaindar. 10. If you are like many and your future sister-in-law was a friend first, this one is the ideal gift idea! Jacquie stamps “sisters by marriage, friends by choice” on the cuff. And makes each bracelet to order. They are made from a sheet of 18-gauge steel, cut, formed, and stamped. Yours will be coated with your choice of sterling silver, rose gold, or yellow gold. And tumbled to a shine. Go here for more info or to buy it from Jacquie. All types of moms need a special gift on their child’s wedding day! It’s a sentimental time for them. You can customize these earrings and necklace to suit any woman in your or your fiance’s lives. 11. “I cannot say enough good things about this shop! She was so quick and efficient” and “Beautiful, can’t wait to give these to my MIL and mom!” are just two of many comments from buyers of these rhinestone drop earrings. Thes are made from AAA zirconium and Swarovski pearls. And come in white, yellow, or rose gold. A seriously awesome value at under $20. Pearl will include the standard message on the card. Or have them print your own words. Mother of the Groom: Thank you for raising the man of my dreams. I will love your son with my whole heart for my whole life! Mother of the Bride: Today a bride, tomorrow a wife, forever your little girl. Love you forever, Mom! Take a look and buy here. And look for the matching necklace option when you checkout. 12. We’re talking serious value for this pearl charm bracelet. Under $15 for one and the price goes down if you order multiples! Karen has over 40 different heart charms. You can quite literally buy these for any woman in your life. At this price, I have to name these bracelets “Best deal for a budget wedding.” Get them here. There you have it! 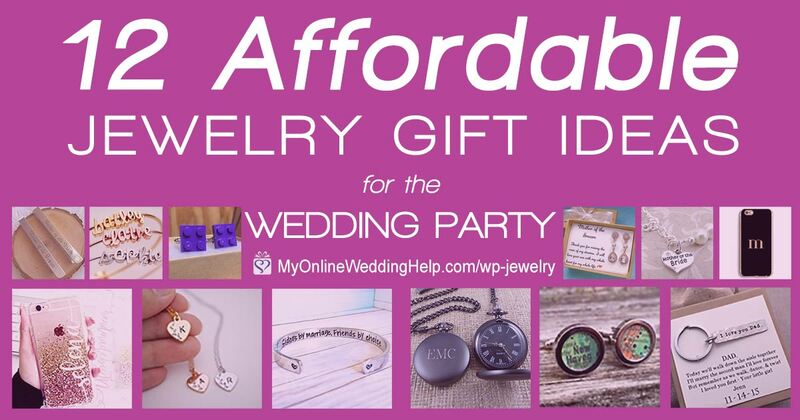 Inspiration for affordable wedding party gift jewelry. Now go shop!